Hereditary is a horror film for our modern times - a film about guilt, shame, mental illness, the impact these horrors have on our families, and how they have the potential to manifest themselves into something indescribably evil. The film begins with the funeral of Annie's (played by Toni Collette) mother, who Annie describes as as a very private woman with private friends who performed private rituals. It's an odd and awkward thing to say at a funeral to a room full of strangers, and you can tell from the very start that Annie had a troubled relationship with her mother. The moment also sets the tone for us viewers. There's something off about the statement that alludes to something far darker and secretive in the family. It turns out that the truth is even more disturbing than you can imagine. Annie is an artist, and builds intricate dollhouse miniatures featuring her family and events in her life. It's eerie - and at times deeply fucked up - but we also begin to understand that this is Annie's way of feeling some control over her life. She's able to manipulate the scenes, placing elements where she dictates, and it gives her a way of making sense of the terrible things she's endured. But the use of miniatures throughout the film also points to something more frightening. The film opens with a view of one of Annie's models. The camera zooms in closer until we see the figures moving inside are real people. The sense is that something else - a force more powerful than them - is containing and controlling the family; moving them through life. They are mere playthings, actors being used and manipulated for a larger plot. Annie's family - husband Steve, her daughter Charlie, and her son Peter - are aware that Annie is unhinged and attempt to escape it in different ways, especially the children. Charlie finds solace in a treehouse in her backyard, while Peter smokes a lot of weed. The reason for the children's desire to escape their mother is crystal clear. In a scene where she talks about her tendency to sleepwalk, and how one night she covered her children in paint thinner and lit a match. Annie's reaction to her own inherent violence is defensive. She insists that she "of course" loves her children and that she was "only" sleepwalking and didn't really want to kill her children. Those themes run throughout the film, and by the end family history, violence, and mental illness all come together in a perfect storm. The results are chilling. Those who read Hereditary in a literal way may find the end of the film disappointing. Some of the visuals lose their potency, and I have to admit that there's a goofiness about the film's final moments (though I think this may be partly intentional). 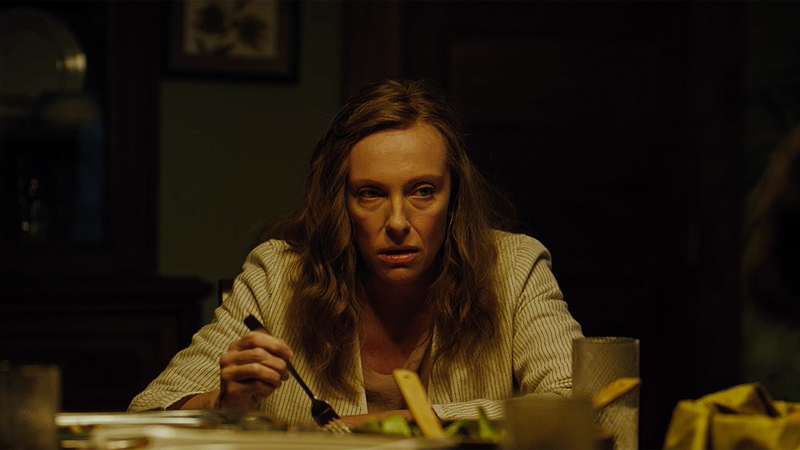 But I have to say - Hereditary got me. At one point during the later moments of the film I got the chills, and they wouldn't go away, no matter how much I tried to shake them. The hype surrounding Hereditary is warranted. This is a truly scary film with a rich subtext. There's a lot to unpack (wonderful for overthinkers!) and I found myself absolutely horrified by the implications of what I was seeing. Toni Collette is masterful in her role as Annie, and the rest of the cast matches her every step of the way. Hereditary is a film that taps into the inky darkness of family lineage, and tells a story something we can all relate to on some level, despite our desire to distance ourselves. Who knows what monstrous creatures sit in our historical bloodline? What violence and madness did they engage in? And most frighteningly - what traits and characteristics have we inherited from them? After all, their blood pulses beneath the surface of our skin, and courses through our veins.